It’s an interesting place to find yourself. We start at the beginning because we want to get to the end – the goal. Our desire to get to the end is what drives us to start and compels us to keep going. It’s also our desire to get to the end that can cause us to fail. Sometimes the end seems so far away that we think we will never make it. Other times, we begin with such enthusiasm that we use up our energy or damage ourselves enough that we begin to question if getting to the end is actually worth the price. Regardless of the desire, as humans we want to get to the end – the goal. And we want to get there fast. If you look at race horses with a strong desire to win. Many start out of the gate too quickly. By the end of the race they lose steam. A horse that starts out more gradually may easily pick up the pace and zoom right past the fast starter for the win. If you look at anything- whether you want to be a painter, a writer, a computer programmer. You don’t start at the beginning AS IF you are at the end. If your desire is to design the most gorgeous website in the universe, you start someplace simpler. You learn basic code and basic skills in design that will help you get to the end- that beautifully designed website that you want to create. If your desire is to write a book, you don’t start by having a finished book. You start by writing. Word by word, page by page, chapter by chapter until you get to the end- your beautiful book. If you want to be a superb painter and create life-like images, you don’t start by creating a life-like image. You start by learning basics, how to shape and how to shade. You learn the steps that will get you to the end- that life-like image you want to paint. When you think about your health and well being it’s the same. You start with a desire to get to the end. -You desire to feel better and have more energy. -You desire to lose 20 lbs and fit into those pants you love. -You desire to be more adventurous in your life, or change your lab numbers before the next Dr.’s appointment. The desire to get to the end may cause you to start with such gung-ho-gusto, that you end up losing steam – just like that race horse – and you stop not long after you start. 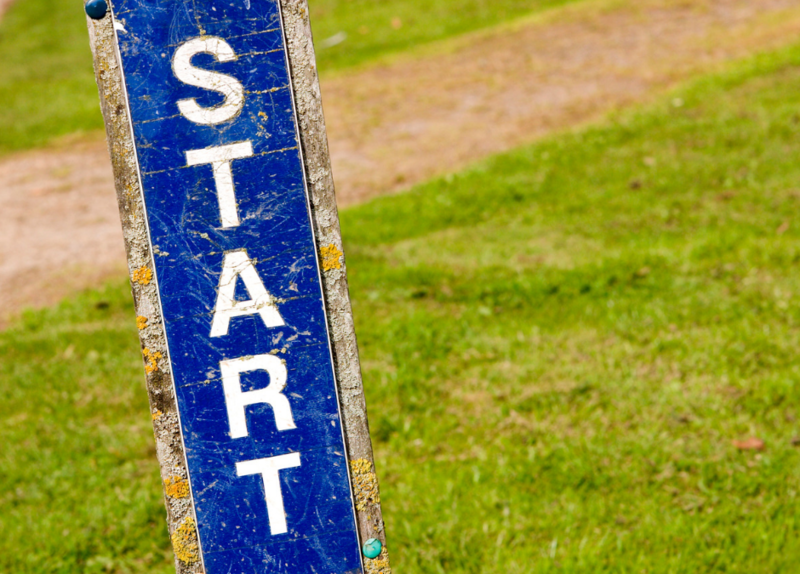 When you find yourself at the beginning- ready to start. Go slow. Go easy. Take your time. Don’t feel rushed to get to the end. Because you won’t reach your goal in a single day. Start by gradually building your skills. Learn more about yourself- how you relate to exercise, how you relate to food, how your body reacts to both. Start with a walk – to the mail box or the end of your street. Return to that every day and gradually increase the distance. Start by adding a few more veggies to your diet or reducing your intake of sweet treats. Then add more good food and notice when your body doesn’t play well with certain foods- then begin to eliminate them. Resist the urge to zoom strait out of the box headlong towards the finish line. Start where you are and gently work your way to where you want to be. Over time, your understanding of yourself will grow and deepen. You’ll know which movement practices and which foods work well for your body. Your stamina will build as you gradually walk farther. Your food choices will become more streamlined. And before you know it, you’ll find yourself at the finish line.